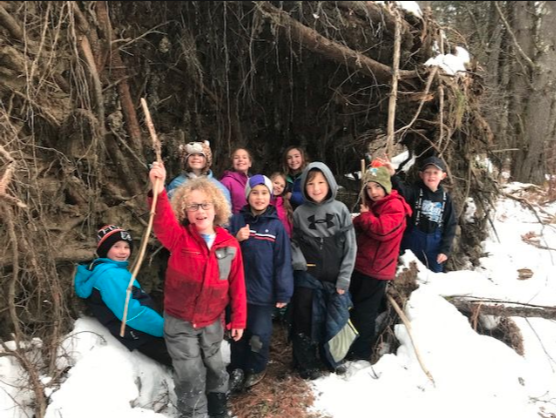 For many Lyme School families our outdoor classroom lessons (which we refer to as Kinderforest in K and Forest Friday in the 3rd grade ) is one of the ways that we are working to utilize our town's vast natural resources in a way that supports the innate investigative curiosity of children and our values for environmental stewardship and ecological awareness. This venture may not sound familiar, but is not uncommon in progressive looking schools around the world. These schools believe that outdoor placed-based experience is an effective way to, “support children’s biological tendency to bond with the natural world”. It allows them opportunity to problem solve in a new space, and fosters empathy for the environment around them. Thinking outside the box and beyond traditional approaches of education will allow us to tap into our students’ young creative minds and begin building a love of learning beyond the classroom walls. Asking them to demonstrate resilience and focus through hands on critical-thinking, across various settings, will allow more students to thrive as lifelong learners. Placed-based ecology education (PBEE) is a prudent approach in connecting our young learners with the community around them. It brings a classroom to life as nature ideas and artifacts are carried in by students daily. Relationships between students, as well as with their teacher thrive as they connect about the endless observations and wonders of nature. Not to mention, as a placed-based educator you have a bit of influence over your students when they go home at night, and on the weekends. You hear their stories Monday morning as they name the frogs they heard, or classify the ferns they saw. As educators we work to create opportunities for our students to develop a connection to their world, a world which also includes the natural world life. David Sobel logically points out in his book Beyond Ecophobia, that “early childhood activities should center on enhancing the developmental tendency toward empathy with the natural world”. He continues to report that as children develop, their tendencies in nature do, as well. They begin needing space to explore and express curiosity.